For the past one hundred years, Americans have argued and worried about the quality of their schools. Some charged that students were not learning enough, while others complained that the schools were not furthering social progress. 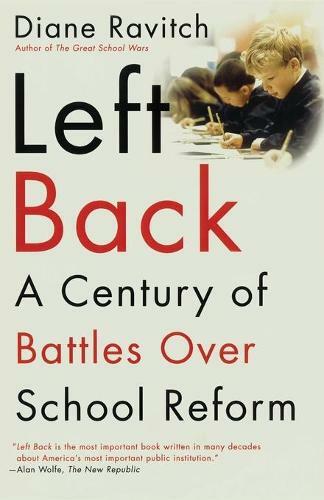 In Left Back, education historian Diane Ravitch describes this ongoing battle of ideas and explains why school reform has so often disappointed. She recounts grandiose efforts to use the schools for social engineering, even while those efforts diminished the schools' ability to provide a high-quality education for all children. By illuminating the history of education in the twentieth century, Left Back points the way to reviving American schools today. Source: Simon & Schuster Last Updated: 05/07/2001 Last Sent to NetRead: 11/18/2007 Author Bio Diane Ravitch is one of the nation's foremost historians of education and a leading education policy analyst. Her landmark books deeply influenced the national discussion of education standards in the 1980s and 1990s. She has been a professor at Teachers College, Columbia University, and at New York University. She served in the U.S. Department of Education as assistant secretary in charge of education research. She currently holds the Brown Chair in Education Studies at the Brookings Institution, edits Brookings Papers on Education Policy, and is a member of the National Assessment Governing Board. She lives in Brooklyn, New York. Alan Wolfe The New Republic Left Back is the most important book written in many decades about America's most important public institution. Gail Russell Chaddock The Christian Science Monitor Diane Ravitch's latest -- and best -- history of education reform in the United States...could help frame the education debate for the twenty-first century. Joseph Adelson The Wall Street Journal Does much to convey what went wrong with the schools -- and what is still right about them. Richard Rothstein The New York Times An important new book.